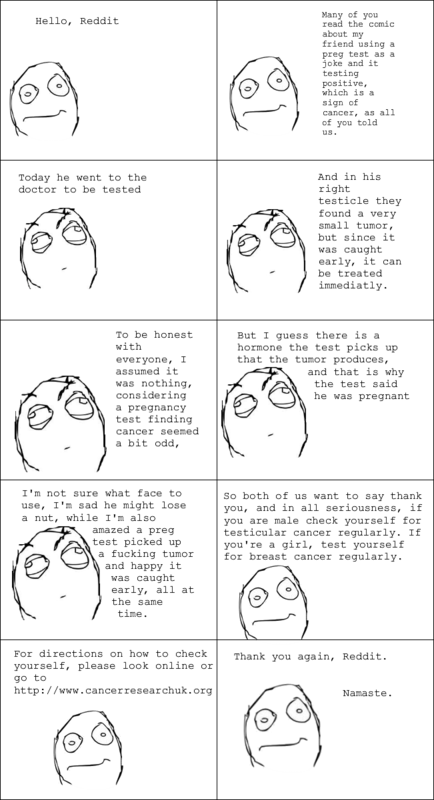 Last week, a Reddit user posted a comic she made, after a male friend took a home-pregnancy test and it turned up positive. Funny stuff, indeed. That’s when some other Reddit users — including medical students — told her that her friend should get checked for testicular cancer. She drew another comic (language warning). *IF* you can wade through all the junk (funny, NSFW, weird ranting etc) Reddit has an amazing depth of user created wisdom. Just plan on devoting hours to going down the rabbit hole. I find it utterly impossible to navigate through the site and which someone would figure out how to clean it up, because I know there’s good stuff there.